Acer's Chromebook Tab 10 (D651N) is the World's first Chrome OS tablet for Education. Acer today unveiled the first education tablet running Chrome OS, the Acer Chromebook Tab 10 (D651N). The new Acer Chromebook Tab 10 is designed for Acer's education customers and will be used in K-12 classrooms to expand and enhance student learning by bringing the speed, simplicity and security of Chrome OS into the tablet form factor. Acer's Chromebook Tab 10 features a 9.7-inch QXGA IPS touch display. Providing 2048 x 1536 resolution at 264 pixels per inch, the display offers students incredibly clear perspectives on the topics they are studying. In addition, the Acer Chromebook Tab 10 fully supports Google Play, which gives teachers and students access to educational Android apps that have been approved and curated by administrators to let them collaborate, discover, engage and learn. 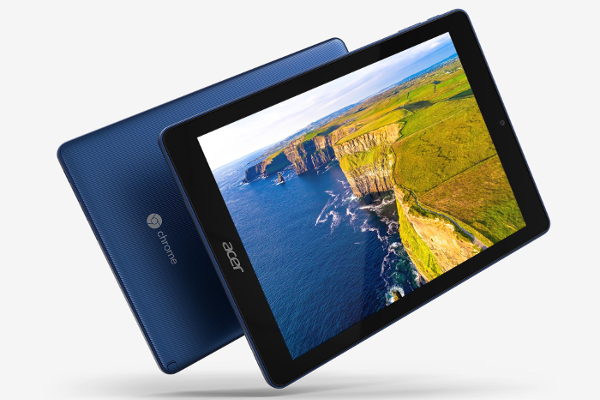 The compact size ensures that the Acer Chromebook Tab 10 easily fits in a backpack or desk, and the unique cobalt blue color makes it stand out so it's easy to find. The Acer Chromebook Tab 10 weighs only 1.21 pounds (550g) and measures just 6.78 (W) x 9.38 (D) x 0.39 (H) inches [172.2 (W) x 238.2 (D) x 9.98 (H) mm]. Students can use the front 2MP HD webcam and dual accompanying speakers and microphone for chats over Google Hangouts. The rear 5MP camera enables students to capture video and images. To give students additional ways to interact with the Acer Chromebook Tab 10, the device comes standard with a Wacom EMR stylus. Students can work precisely with interactive apps, sketch, take notes and capture ideas that can be shared with classmates and teachers. The Wacom EMR stylus can be embedded in the chassis dock for secure storage. Plus, it doesn’t require a battery and is resistant to accidental drops. The Acer Chromebook Tab 10 provides long battery life of up to 9 hours - enough for 1:1 programs where students use them throughout their school day, as well as at home for projects. Schools with dedicated labs and wireless carts can use the Acer Chromebook Tab 10 over several days of classroom time. IT administrators can manage the new Acer Chromebook Tab 10 as easily as any of the other Chrome OS-based devices on their campus. They can make updates, configure apps, as well as manage extensions and policies with the Chrome Education license. The Acer Chromebook Tab 10 can be shared throughout the school site and in labs since Chrome OS supports multiple user sign-in, giving students quick access to their information, apps, projects, Gmail and more when they log onto their unique account. Even if a device is lost, stolen or damaged, students won't lose their information. Storage on Google Drive protects files, documents and photos safely in the cloud, and ensures that the most current version is always available. Plus, Chrome OS is automatically updated and guards students against ever-changing online threats, such as viruses and malware. The Acer Chromebook Tab 10 responds quickly and can run multiple apps at once, as it's powered by an OP1 Processor that integrates dual-core Cortex-A72 and quad-core Cortex-A53 processors. Also, it includes 4GB of RAM and 32GB of on-board storage. Students will stay connected to their school's network with fast and reliable 2x2 MIMO 802.11ac Wi-Fi connectivity and can connect to displays and other devices via Bluetooth 4.1. The new Acer Chromebook Tab 10 includes a USB 3.1 Type-C Gen 1 port, which can be used to charge the device as well as other products, transfer data quickly up to 5Gbps, and connect to an HD display. It also features combo headphone/speaker jack and a MicroSD card reader. The Acer Chromebook Tab 10 will support augmented reality in the future to allow students to experience new ways of learning with Expeditions AR. Expeditions AR is Google's AR technology that maps the classroom and places 3D objects in it for students to study, making subjects such as biology, geography and astronomy easier to comprehend. Dimensions: Measures 6.78 (W) x 9.38 (D) x 0.39 (H) inches [172.2 (W) x 238.2 (D) x 9.98 (H) mm]. The new Acer Chromebook Tab 10 (D651N) will be available to education and commercial customers in North America in April priced at US$329 and in EMEA in May priced at €329 (including VAT).